Welcome to Day 5 of the SKOHRboard & Stangs League 2011 NFL Mock Draft. Coming off of back to back days that featured positional runs who knows what is in store for today. But with teams choosing who have such varied needs as the Giants, Bucs, Chiefs, and Colts it's sure to be interesting to see how it unfolds. The Giants could have gone in a number of different directions with this pick. They could use a strong side LB to complement a good run defender in Goff and pass defender in Boley. Former second round pick, Clint Sintim, has been a disappointment and Keith Bulluck is headed for free agency. Defensive tackle may also be viewed as a position of need with Barry Cofield also headed to free agency. But a combination of injuries and age has made the O-line New York’s top priority in this year’s draft. The Giants did a great job of shuffling bodies up and down the O-line last year but they can’t hope for that kind of luck again. With their starting center Shaun O’Hara coming off two off-season surgeries and their starting guard Rich Seubert trying to recover from knee surgery nothing makes more sense than to draft a guy like Pouncey who can play both positions. 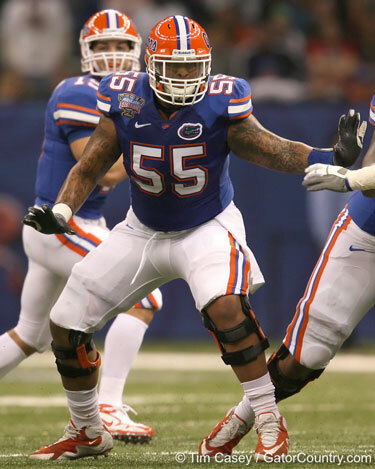 Pouncey can add great depth to a banged up line or be plugged in as a starter from day one. The Giants love versatile guys and it doesn’t get anymore versatile in this year's OL class than Pouncey. The Buccaneers were a revelation last year, coming from seemingly nowhere to become a ten-win team that barely missed the playoffs. 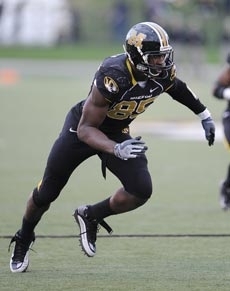 Now at pick #20 they luck out and get a guy with top-ten talent in Missouri DE Aldon Smith. The Bucs had great success in the draft last year, drafting their interior defensive lineman for hopefully the next decade in Gerald McCoy and Brian Price, and two great receivers in Mike Williams and Arrelious Benn; the emergence of Josh Freeman suddenly makes this an exciting young team. The Bucs have key needs at CB to replace the aging Ronde Barber and probably to replace the destined-to-be-jailed Aqib Talib, but there is also a pressing need at a rush defensive end. Smith is a great athlete, capable of playing a 4-3 defensive end in his preferred style of the four-point stance (which always looks cool) or he can play out in space as a 3-4 defensive end. He draws comparisons to DeMarcus Ware, which tends to be a good thing. This is the exact kind of competitive guy that Tampa Bay always used to march out when they were under Tony Dungy; he'll be a great fit at a need position for the franchise. The Chiefs made their living on the ground last year playing a run first ball control offense. They lead the league in rushing and won their division doing so. Expect Coach Haley to continue using this approach this season and nothing says run game like a right offensive tackle. Anthony Castonzo is a rock solid pass-protector with a big run blocking upside that can start from day one and book end Branden Albert for the next 10 years. He will also provide the Chiefs with another young cornerstone to an already very young team on the rise. Matt Cassel is river dancing as we speak. The Colts were a little pissed to see both of their preferred lineman go minutes before their pick, but you can't go wrong selecting a four-year starter to help man the right tackle position for the next decade of Manning's immortal career. Did I mention his nickname? Carimi is known as "The Jewish Hammer", and that probably means more to me than his Outland Trophy and his status as a consensus All-American. 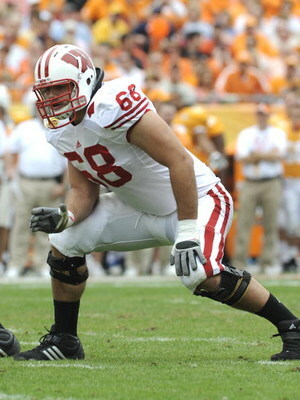 It is a rare talent that can come in and immediately fill the hole of a star, but when Joe Thomas declared for the draft four years ago, Wisconsin was blessed with The Hammer's impressive blocking. In looking for experience in a young player, the Colts draft a player that has started 49 of 52 possible college games. Carimi is the type of player that "you try at Left Tackle, and if he fails... you've got an All-Star Right Tackle" according to Mike Mayock. Indeed, his pass protection has already been graded as NFL-caliber: something tells me that Peyton Manning will like that. 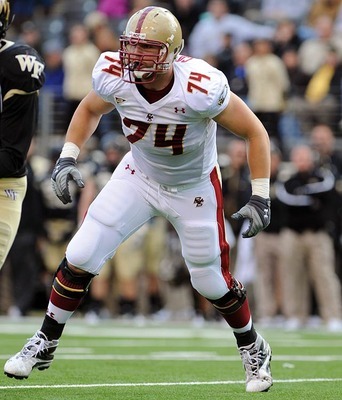 He is also quite capable as a run-blcoker, and he will use his athleticism to win a lot of battles in the trenches. However, his skills seem a perfect fit for the Colts offense, and could be a piece in the puzzle that gets Manning another shot at winning (but probably losing) another few rings. #24 New Orleans - Justin!